Our regular viewers will know Bob Harper and his travels with his Maine style sections of his home layout. 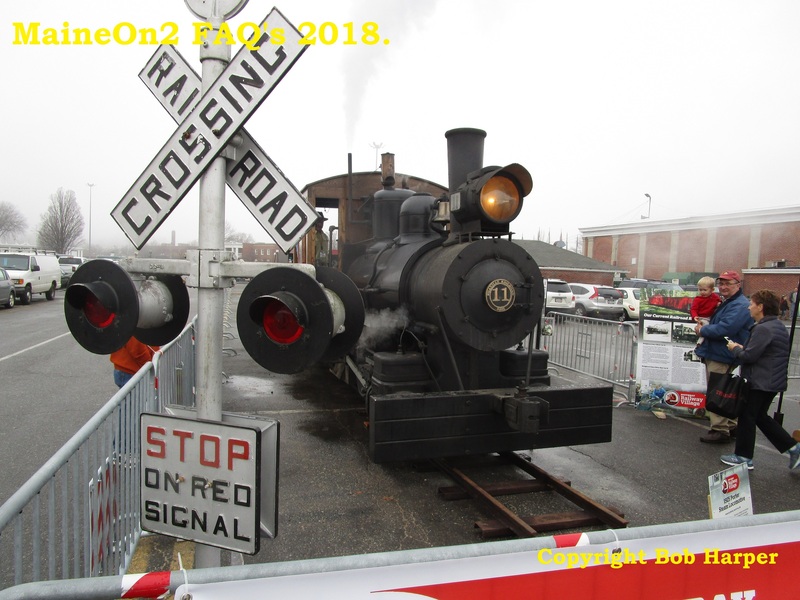 His most recent adventure has been to attend The Amherst Railway Show at the Great Eastern Exposition Fairgrounds in West Springfield, Massachusetts, in January 2018. 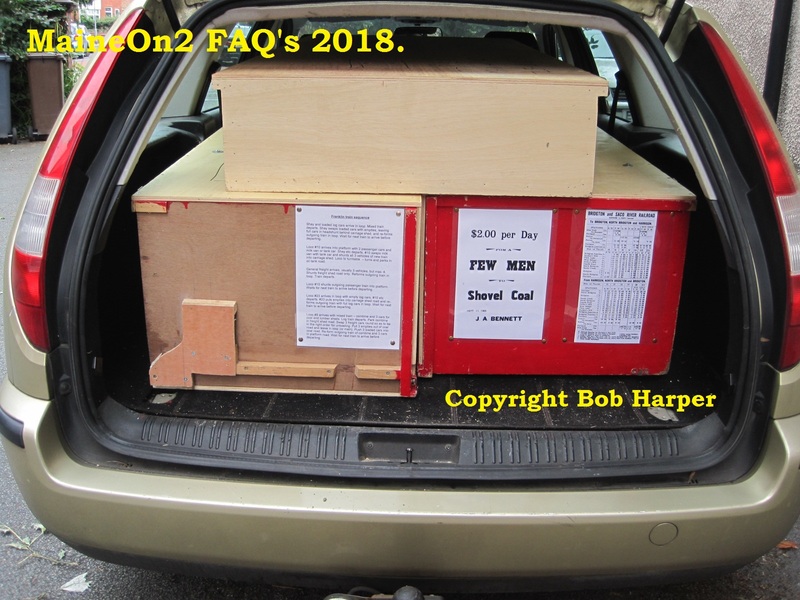 In this post Bob has written and taken photographs showing how the module is packed to withstand the rigours of airfreight and other travels. 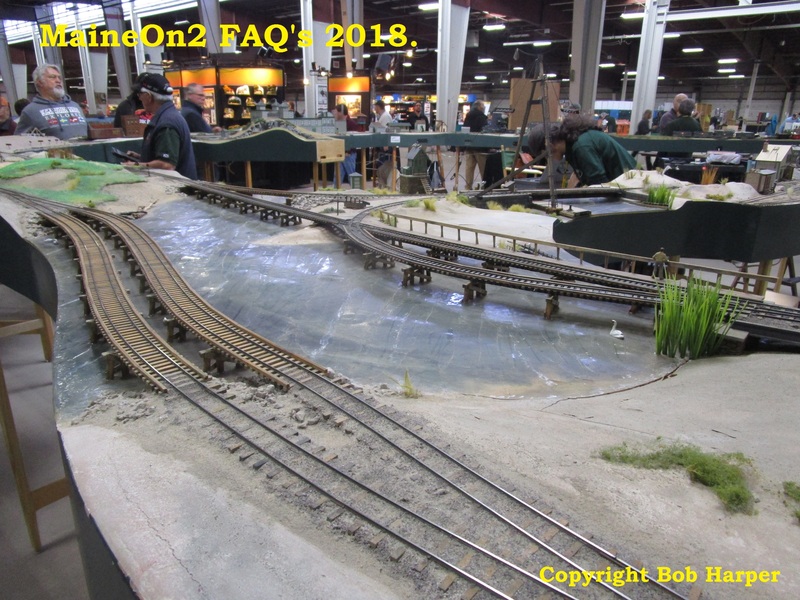 Bob’s brother, Gerald, also a keen model railroader lives in Toronto, so it is natural for Bob to travel to Toronto, and then drive down to the US venues. Gerald Harper captures a CNR gas electric arriving at Port Rowan on train M233’s schedule. 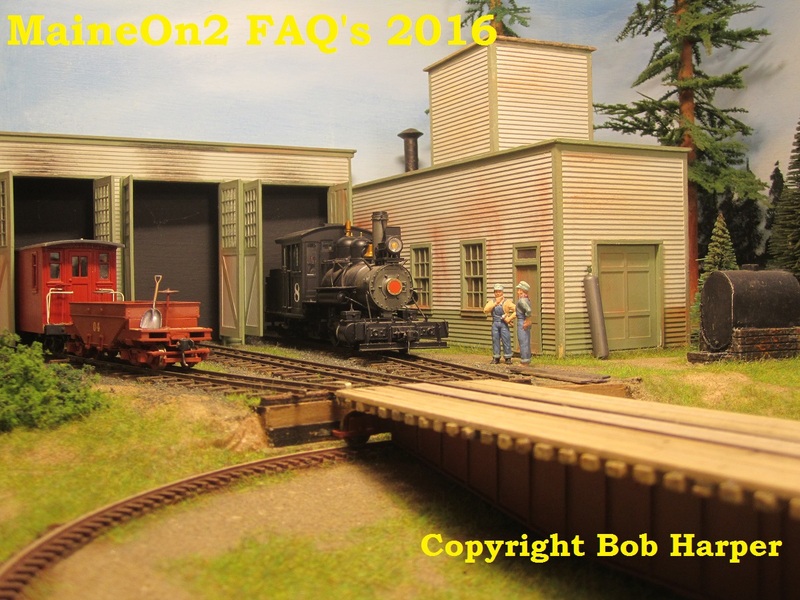 Click here to view Bob’s Franklin module and here to view Bob’s Megantic module on new browser pages. Click here to visit Trevor’s Port Rowan blog on a new browser page. 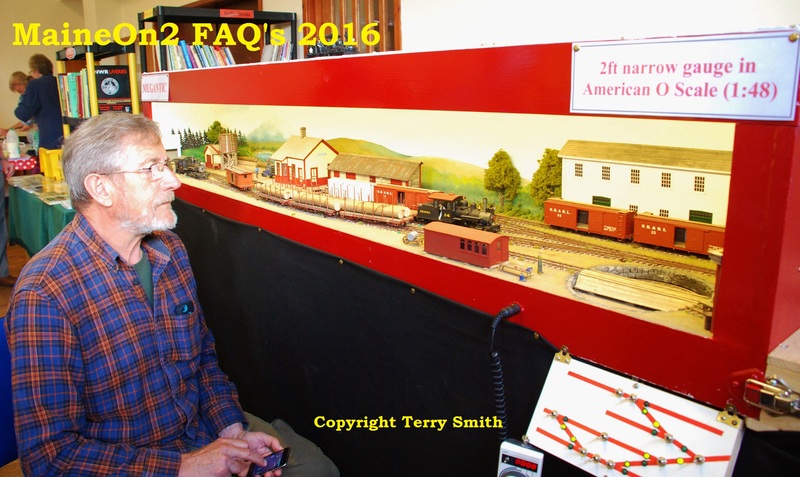 Click here to view the Amherst Railway show website on a new browser page. 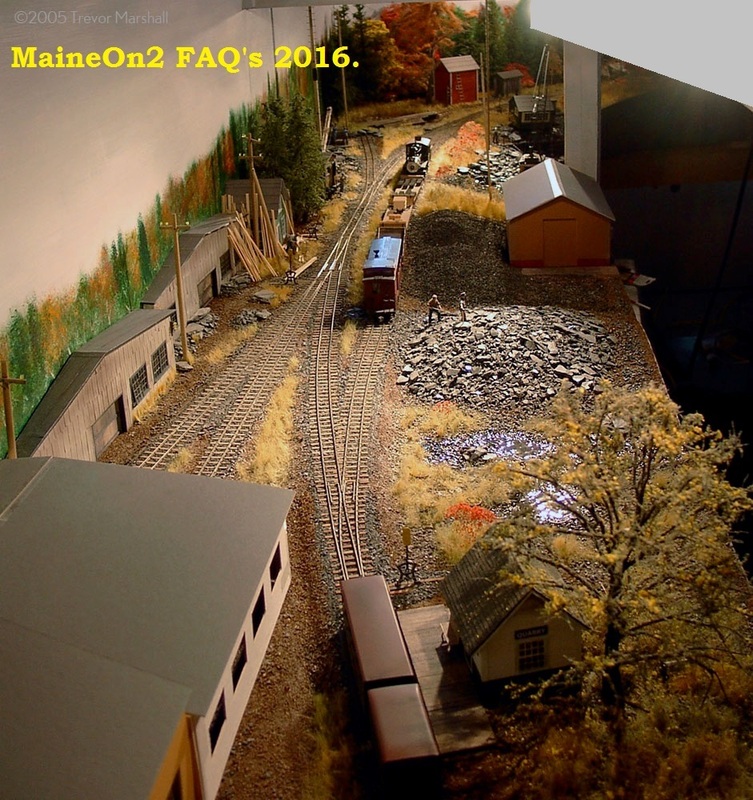 After the relative ease of taking Franklin to the Narrow gauge Convention in Augusta, Maine in 2016, I got over-ambitious and planned to do it again, but on a larger scale. 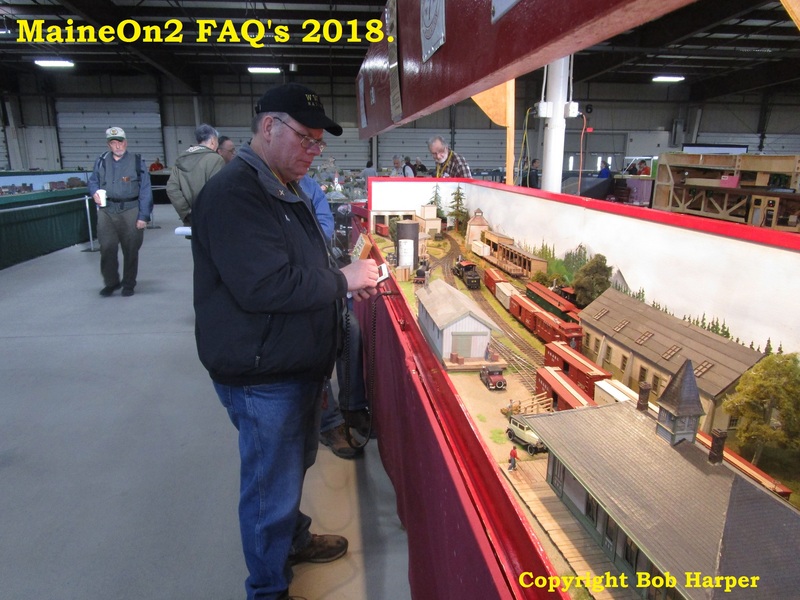 There is an enormous general railway show at West Springfield, Massachusetts, every January, put on by the Amherst Railway Society; probably the biggest show in the US, with 8 acres of hall space and around 20-25000 attendees each year. I got cheeky and asked if I could come, and was welcomed with open arms! Fans of The Simpsons will know that they live in W. Springfield! So I arranged for the layout to come with me to Toronto in late January, and we headed off again over the border (a very tedious experience this time) in my brothers truck. There was a mighty difference this time compared to the Augusta trip in August 2016; the temperature was -10 degrees Celsius and the Mohawk and Hudson Rivers were piles of ice – great blocks built up along both banks, and the whole way across in places. That said, we were very lucky with the weather generally, given how bad it could have been. 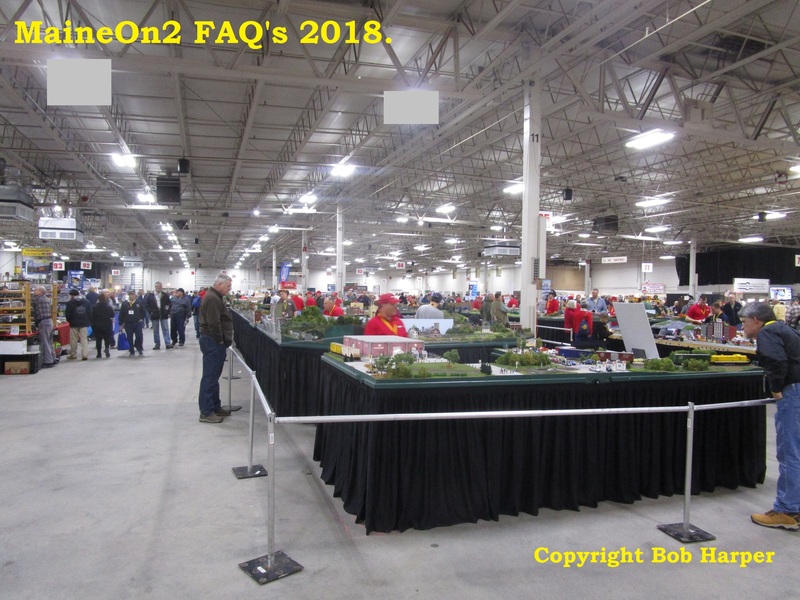 Everything generally went smoothly at the show, the layout in particular running perfectly, though we had some difficulty with general arrangements and information. 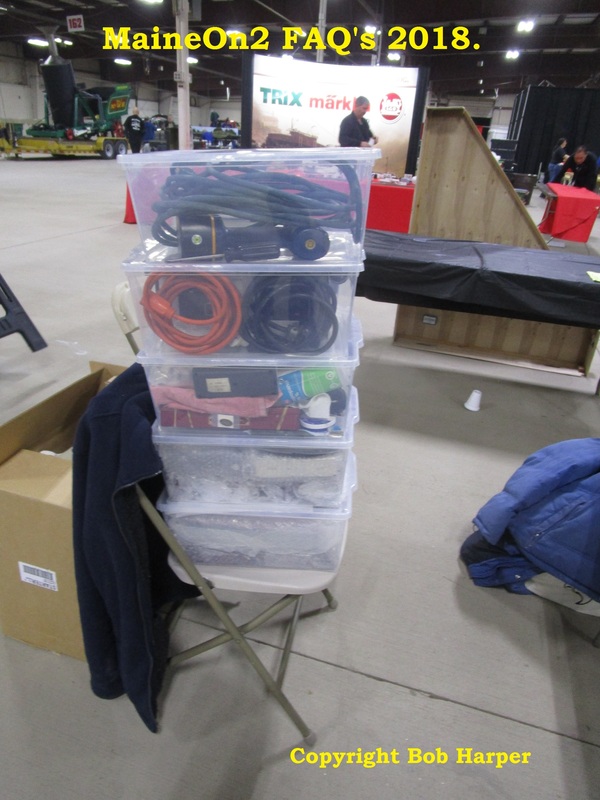 Nearly all the layouts and trade stands come every year, and they all know exactly what to do; so information for new exhibitors was very sparse. As a result, we never found the Saturday evening show dinner, though we didn’t go hungry! Packing up on Sunday evening went smoothly, and then another long drive back to Toronto. This time, rather than bringing the layout straight back to the UK with me, I decided I would leave it, and the rolling stock, in my brothers workshop in Toronto. 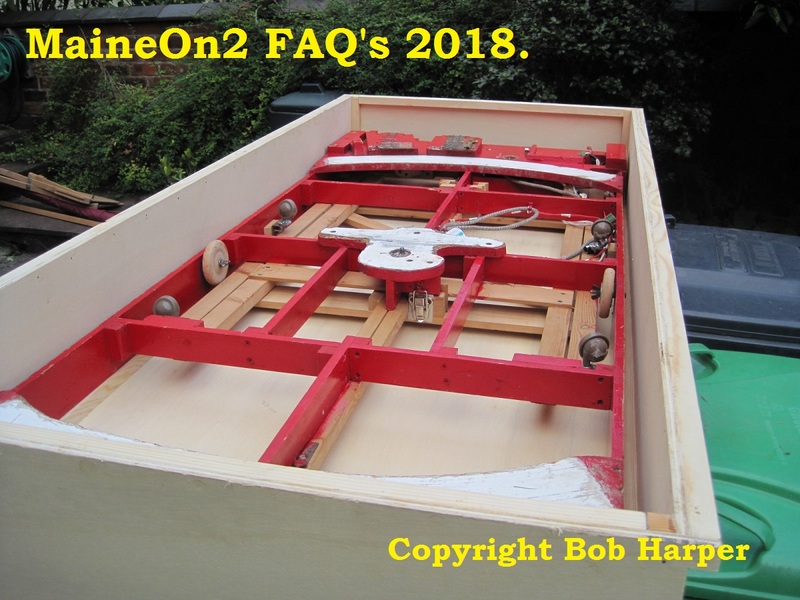 This means that I can also take it to the Canadian Narrow Gauge Exhibition at Schomberg, 30 miles or so north of Toronto, on Saturday 21st April, and the National Narrow Gauge Convention in Minneapolis in early September. Obviously this saves 2 round trips for the layout, and an awful lot of hassle, though I did have a bit more formality with Canadian Customs this time given that it was staying in the country for 9 months rather than 10 days. So now I’m back in the UK, with only exhibition appearances for my Great Western standard and broad gauge layouts until the Autumn. Is it worth doing? Financially obviously not, but as an experience of a type of show completely different from a British one, then definitely yes. Although there were thousands of people there, the interest seems to be in the trade stands rather than the layouts. There were rarely more than 1 or 2 people watching any of the layouts, but those who did watch Franklin were usually engrossed for a long time. In particular, everybody was fascinated by my full turntable fiddle yard, where complete trains are turned ready for their next trip. Some people use a simple traverser, but a full rotating yard is a completely new experience. There were a good number of people manning the Maine preservation societies stands, and they made up a large part of my audience. 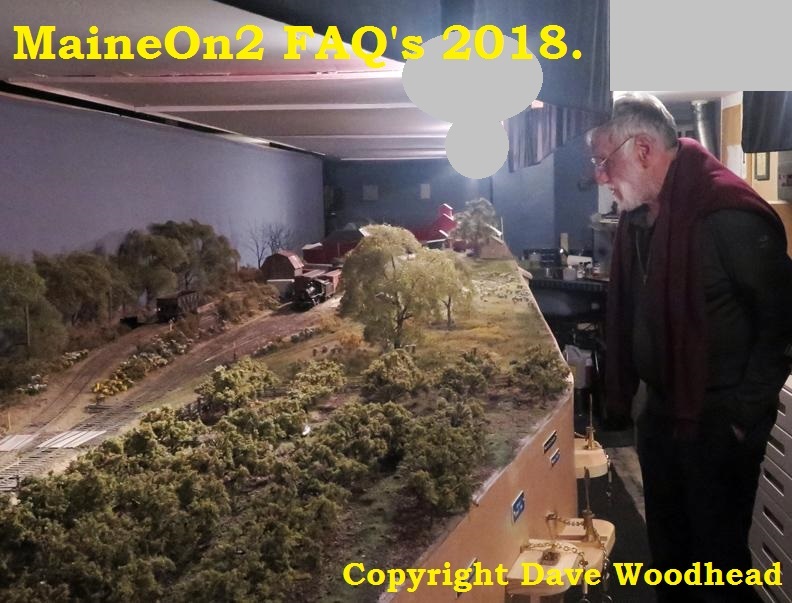 It seemed wonderful to them that their favourite lines could actually be modelled in a meaningful way, with smooth and reliable operation and many of the features of the Maine 2 footers modelled in such a small space. So it was greatly rewarding to present such a novel way of modelling in the land of the actual prototype. A snug fit in the Ford Mondeo Estate for the trip to the airport. The whole layout after collection from Canadian Customs on the other side of the pond. 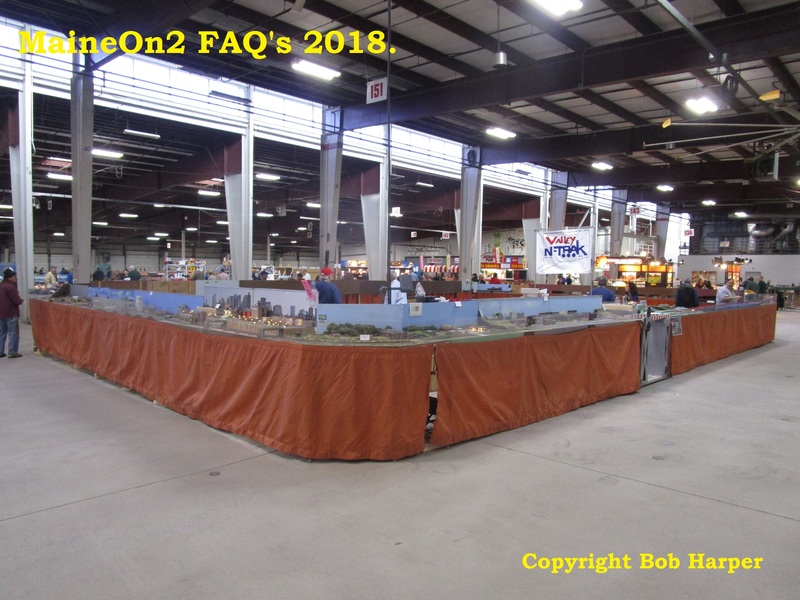 The layout unpacked and set up in one of the 4 halls of the Amherst Railway Show at the Great Eastern Exposition Fairgrounds in West Springfield, Massachusetts. Note that most photographs have not been cropped and edited purposely in order to show the vast amount of space at this show and venue. 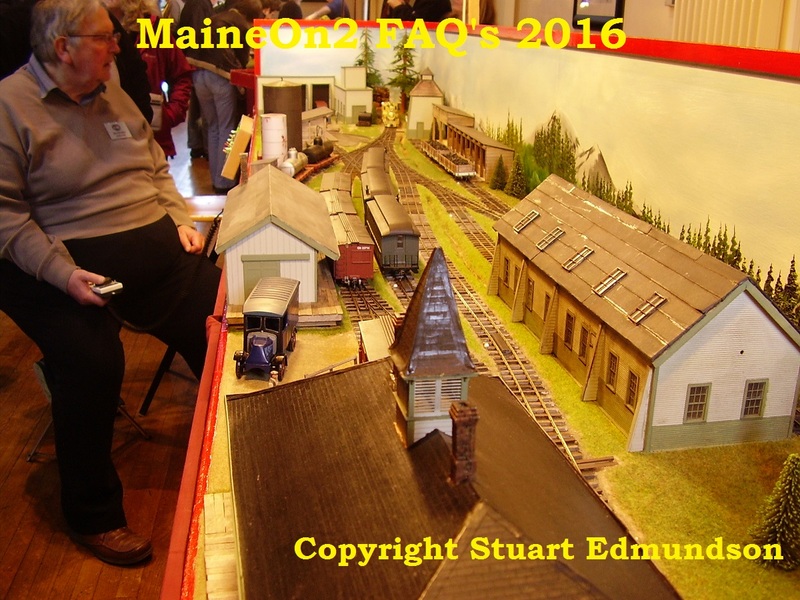 A local New Englander has a go operating my New England layout! 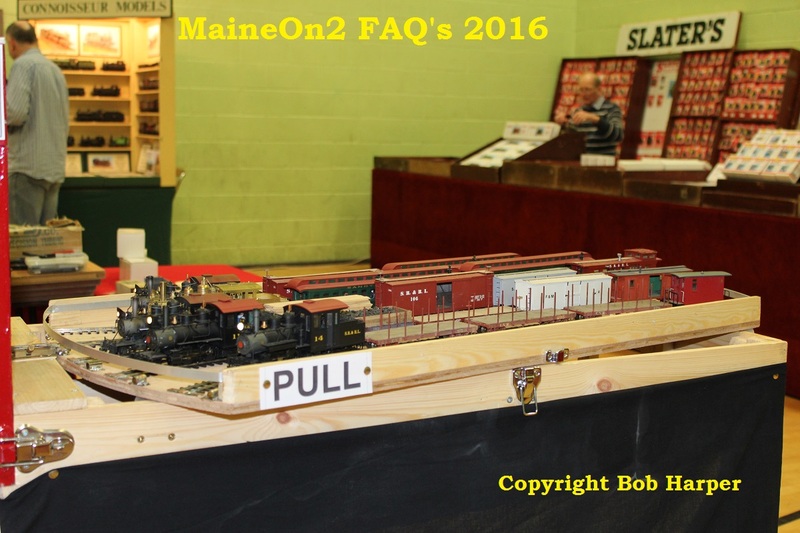 Although there were 17000 people at the show, it was never crowded in our hall, but there was a steady trickle of Maine 2 foot fans from the WW&FR and SR&RL Museum stands coming round to see, and all seemed amazed that such an interesting layout could be fitted in so small a space, and that everything ran so well, with smooth, slow shunting. They were also all amazed by the fiddle yard, especially when they realised that it could turn the whole trains round 180 degrees ready to go out again! So while a lot of cost, work and stress was invested getting Franklin there, it seems to have been a worthwhile educational effort, as it was a completely different concept from all the other layouts there. One of the many modular layouts in the show; this one shows the fairly common scenic mismatch of adjoining boards. However this vast layout has a properly planned gradation from scene to scene. Any Exhibition Manager would be envious of the space available! A general shot showing the staggering size of the show. Remember that this is only one of four halls, though two of them were smaller. Scenes from an On30 modular layout. The standard of scenic modelling was exceptionally high, though some of the physical details are a little unlikely! Sadly this layout suffered from a seeming inability to run any actual trains reliably, a common fault with this type of communal project. This 0-4-0 2ft gauge loco from the Edaville Railway was in steam outside the main hall, though restricted its action to regular whistle blasts. Click here to view a short YouTube segment showing this loco at the Amherst Railway show on a new browser page. 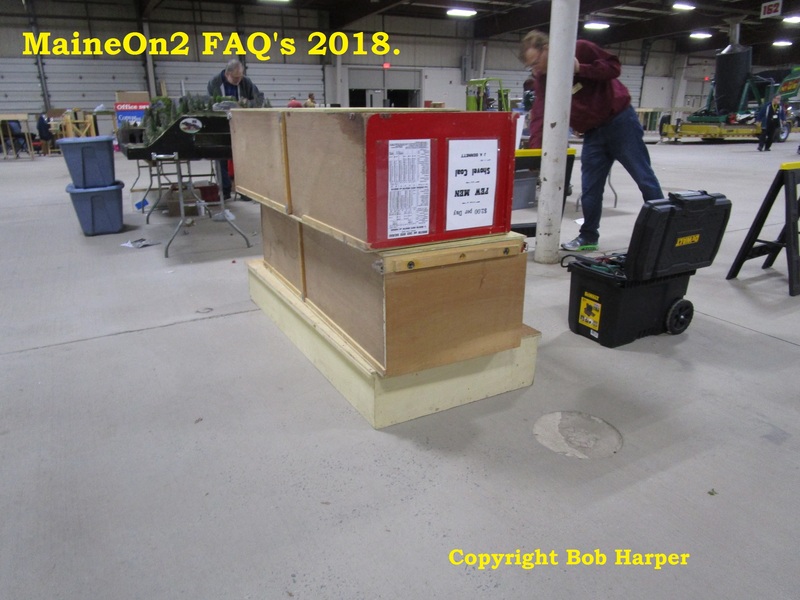 I was surprised how quickly we were able to get the layout dismantled and boxed up again ready for the open air trip back to Toronto. Normally it travels in the back of my car, with no extra protection. I’m glad we did not try that this time, as we ran into a blizzard just after we re-crossed the border into Canada. All the rolling stock and ancillaries came in these crates, which also braved the elements in the back of the truck. The crucial piece of equipment is the power converter, which I bought in Canada. This converts European 230 volts to N. American 115 volts, or vice versa in my case. 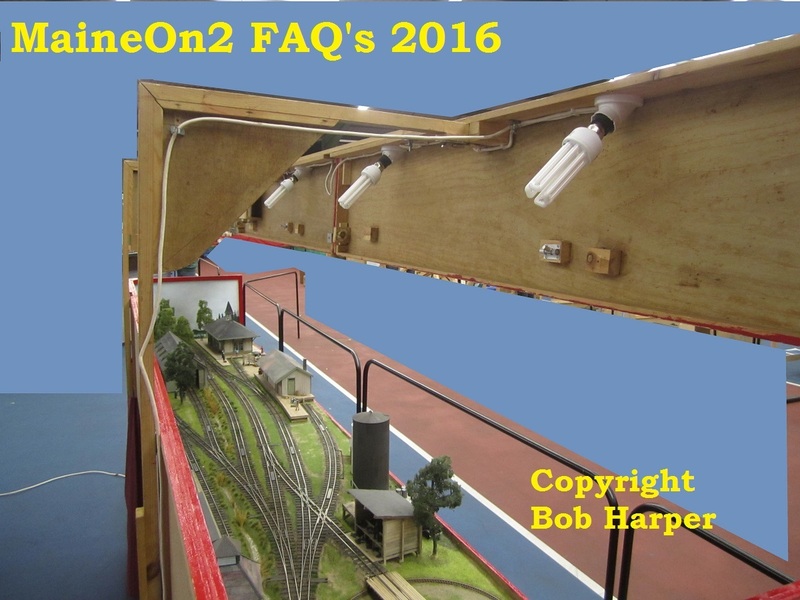 So everything on the layout (lighting, for example) was operated at its normal 230 volts. This seemed easier than trying to rig up temporary 115 volt lighting, power transformer etc. It worked very well, though got pretty warm after a full days operation. 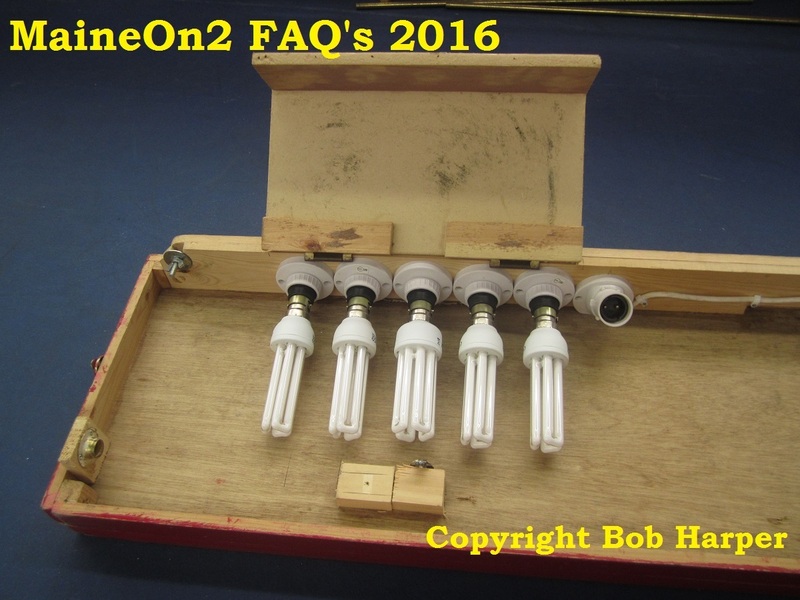 None of my UK light bulbs got broken on the flight either, though I had taken several spares just in case. 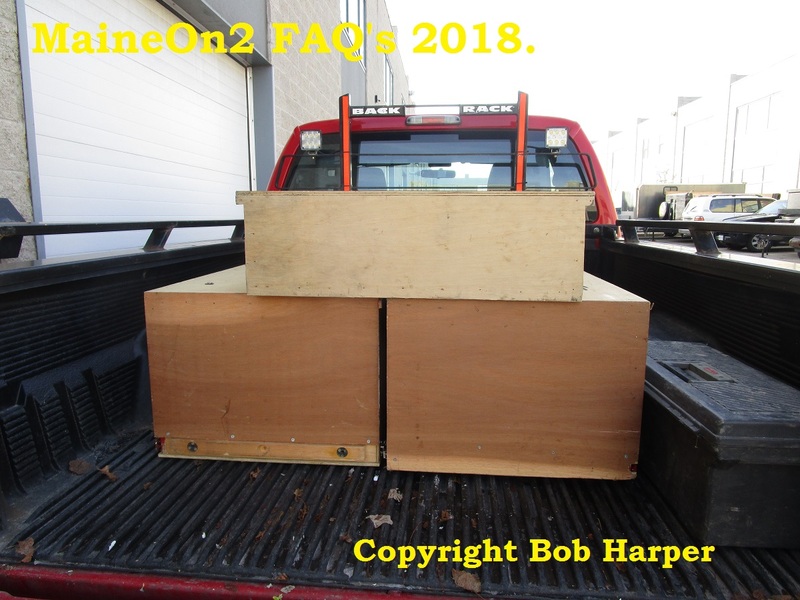 The baseboard boxes and most of the rolling stock have been left in Toronto, so I can go back and do the Canadian Narrow gauge show at Schomberg on April 21st, and Narrow gauge Convention in Minneapolis, 5-8 September. I will then bring everything back finally. Click here to view the Schomberg show and here to visit the 2018 Minneapolis Convention site on new browser pages. Editorial note: The early pictures of Bob Harper’s Franklin module shown here were originally published in one of the last galleries to be published on the original Fotopic pictures FAQ site. As noted elsewhere, that site went belly-up (without warning), and the backup copy made temporarily available a year or so later pre-dated the Franklin gallery revisions, so all the original work was lost. 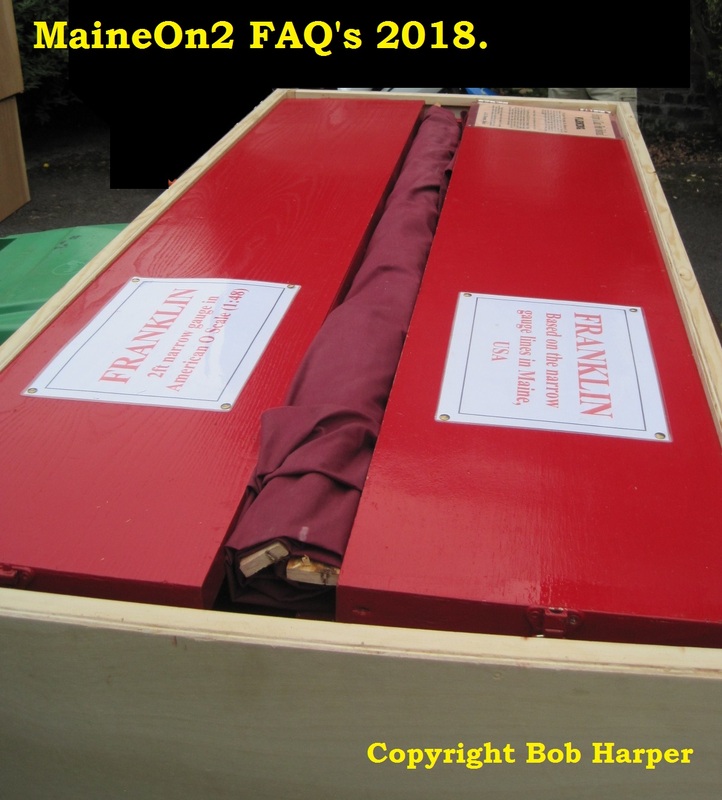 The recent work on Bob’s latest module, (Megantic, click here to view on another browser page) unearthed some of the original Franklin pictures and drafts for the accompanying text, so we present this topic as if it were published in the 2010 to 2012 timeframe. Foreword: UK Style small exhibition layouts, owned and shown by individuals. 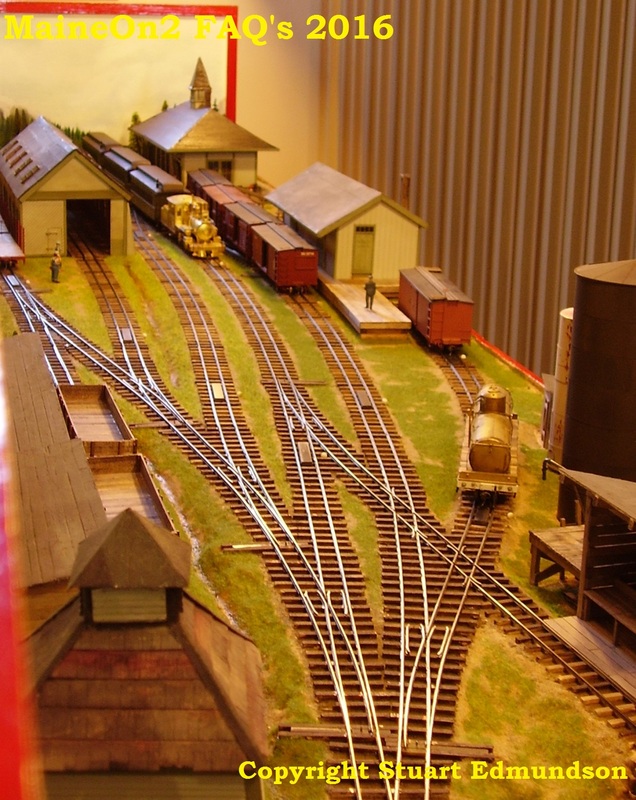 The Franklin module is typical of many UK Exhibition layouts in being relatively small, consisting of three major units; the visible part of the layout is in two pieces with an integral (and solid) backscene and ends, and a non-sceniced fiddle yard section using a multi track centre pivotted sector plate. The two scenic units fold together for transit, and the turntable unit fits on top forming a pretty complete and strong cage to protect the permanently attached scenery and structures whilst in transit. The size of the units is essentially dependant upon the owners’ vehicle or vehicles. At the UK Slim Gauge Circle meet, I helped Bob bring the layout in from his car to the hall in the morning and back again in the afternoon. Bob confirms that his vehicle is a Ford (UK) Mondeo estate car, pretty similar in size to the Audi A4 estate, and quite compact compared to the American cars that I used to rent on my business trips throughout the 80’s and 90’s. 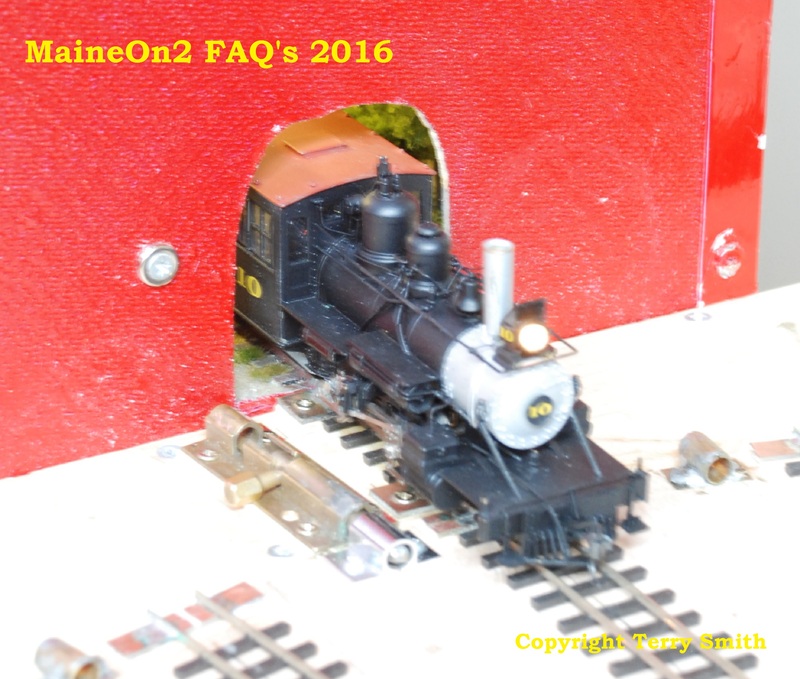 The layout sections were loaded in lengthwise from the rear door. The fiddle yard section has two sets of legs built in and is erected first, and then the sceniced sections are added as they only have/need one set of legs each. 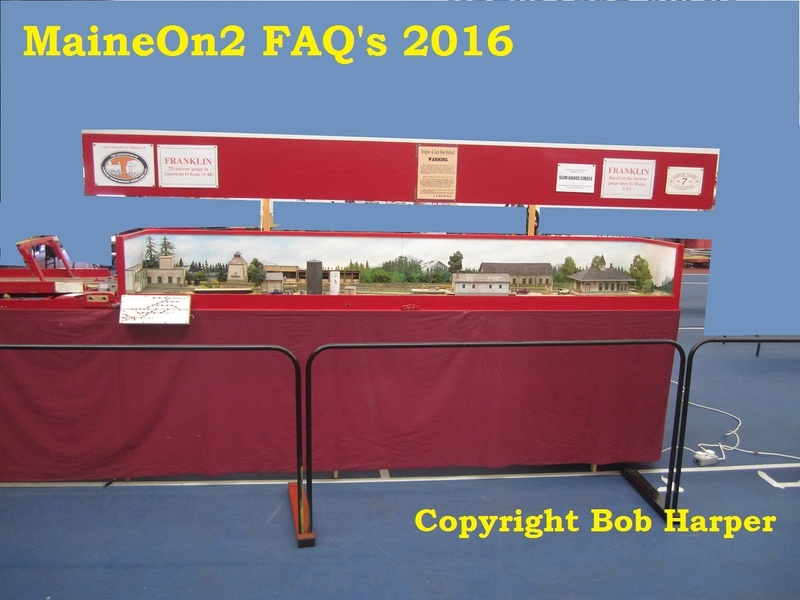 In many cases the exhibition layout is the owners home layout, built so that it is easily transportable for exhibitions or even house moves. In other cases, like Franklin, the exhibition layout is part of the owners home layout designed and built to be easily removable as a section. In a few cases the owner may actually store the layout between exhibitions and only run trains at shows and exhibitions. This style of layout is ideal for a first layout and for those who may have space or other restrictions, or who do not wish to commit to a larger layout. An added advantage for an On2 modeller is the linear nature allowing the larger radius curves required for satisfactory running of the larger Forney locomotives. Bob continues;- “The white-bearded figure on the left of the photo is myself, controlling the layout from an i-pod. This is my latest painstaking mastery of modern technology, and creates a lot of interest at exhibitions. 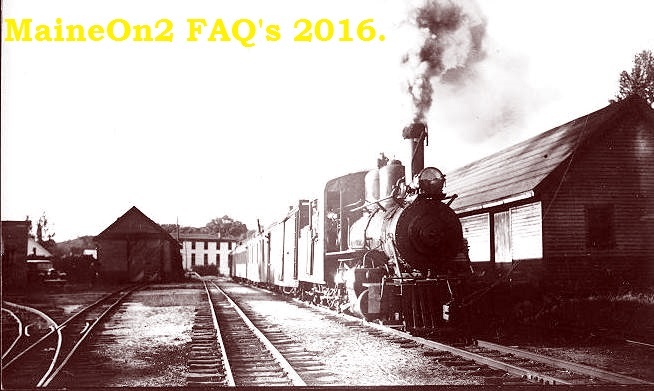 The scenic part of Franklin is 10 feet by 2 feet, and is fed by a 5 foot long turntable “fiddle yard”, with 5 tracks. The station is roughly based on Bridgton, but greatly compressed.” Note the legs and various boxes under the layout that transport the rolling stock etc. 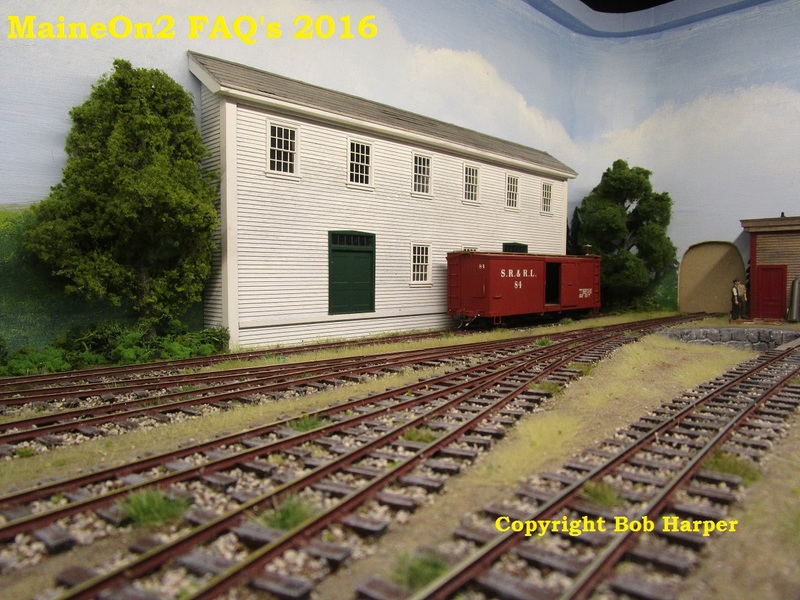 This picture shows a train of Terry Smith’s Bridgton freight cars arriving at Franklin on Bob Harper’s On2 portable layout. 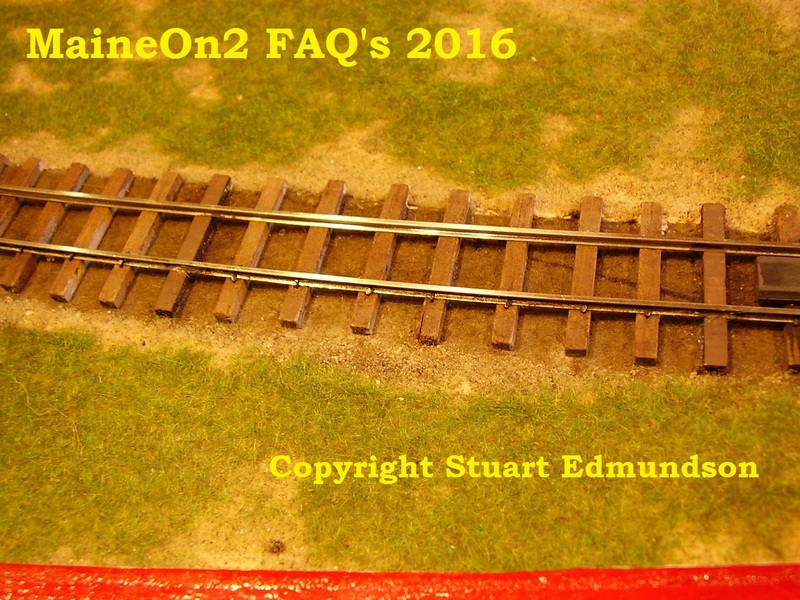 This view emphasises the track-work, which is all hand-built by Bob using Karlgarin code 82 rail. 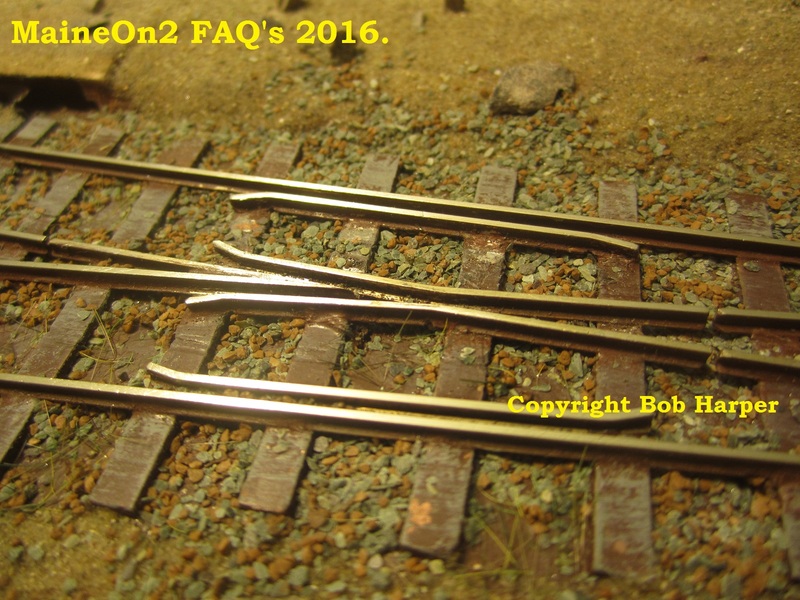 This rail is specially drawn in the UK with heavier sections to suit O scale (and larger) narrow gauge track work. Click here to visit the Karlgarin home page, and here to download a .pdf of the rail sections available. This picture shows the wider head (and base flange) of the Karlgarin rail. The turntable style fiddle yard as folded for travel. The legs hinge upwards (in this view) and are locked in place by struts with toggle latches. The unit is rolled over and upright. This view shows the wooden wheels and upturned furniture castors which assist in taking the weight of the turntable when rotating. The turntable fiddle yard is fitted with two sets of legs, and so is free standing. 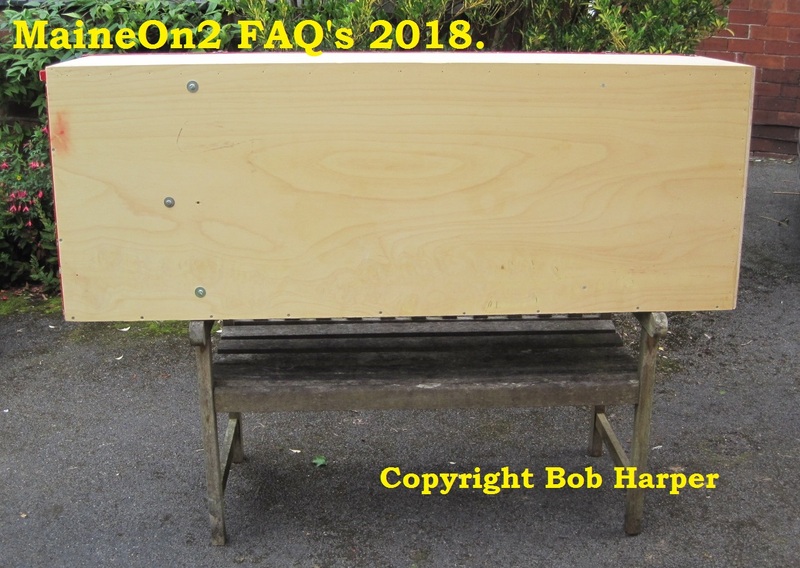 Both of the scenic boards are fitted with one pair of legs only and so must be erected and connected to the fiddle yard and first board in sequence. The legs are visible in the heading picture. 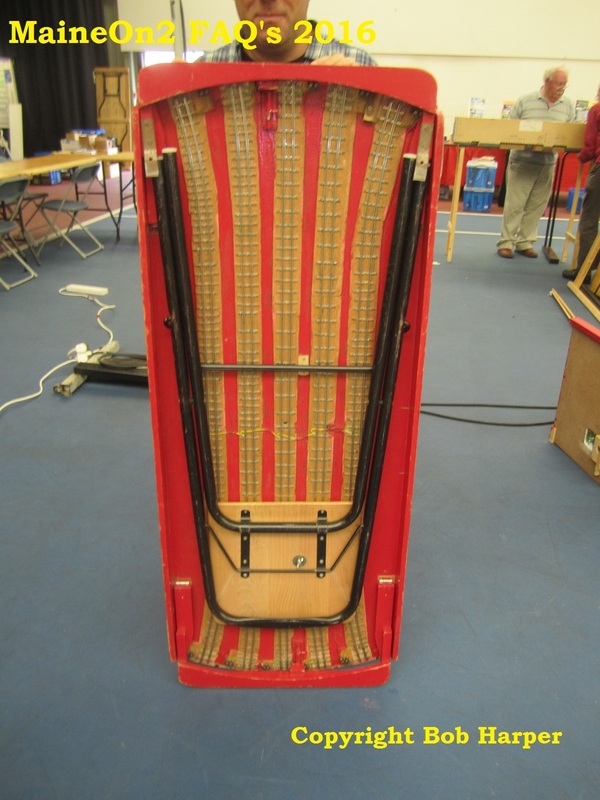 The picture also shows the travelling position of an essential piece of equipment, the folding stool which Bob and other operators can sit on at the front of the layout while conversing with visitors and occasionally operating trains. 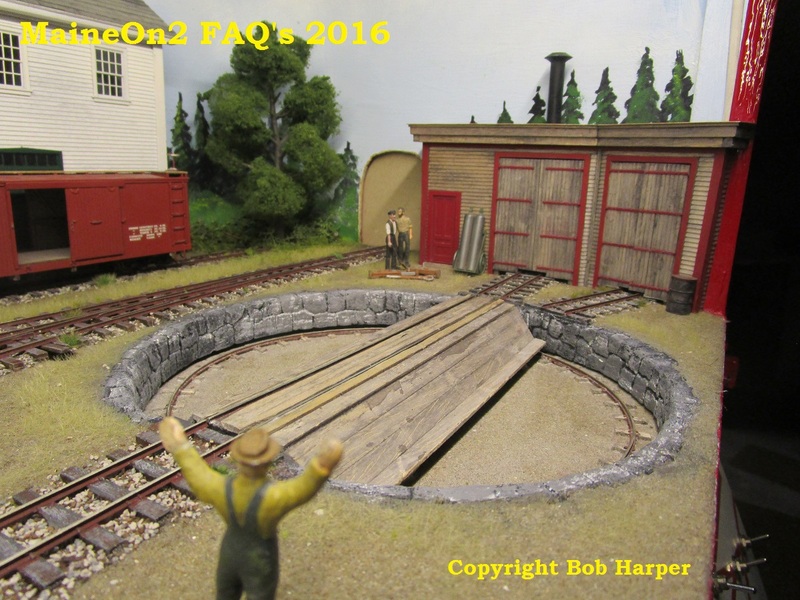 Bob explains;- “the track on the turntable looks complicated as it was originally built for my On3 exhibition layout, “Cascade Yard”, which has 2 entrances to the yard and is a different width to “Franklin”. When I was getting Franklin ready for its first show I realised that I could share the old fiddle yard with the new layout, by adding the On2 track down the middle of the On3. 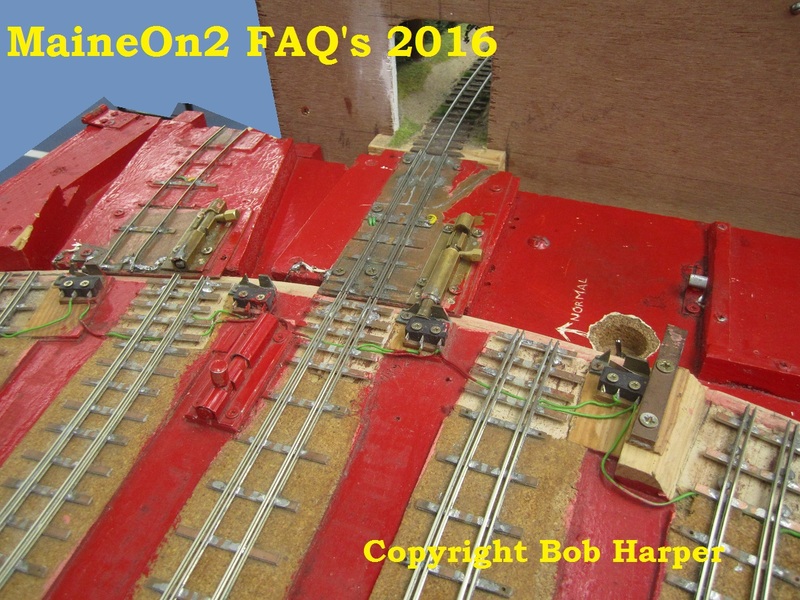 Hence the 4 rails – 2 gauges, not check rails!”. Like many UK exhibition layouts, Franklin has its own lighting system, built into a folding fascia that frames the layout like a theatre proscenium arch. Illumination is provided by a set of CFD “bulbs”, which were rather expensive on initial purchase in the UK when the layout was built. A “before the storm shot” below; the layout has now been fully erected, and after an electrical check can be connected to the mains supply, and rolling stock un-packed, and the paying visitors admitted. Note the use of a cloth curtain in the picture below to hide all the detritus under the layout visible in the heading picture. – and here’s the continuation shot showing the turntable fiddle yard ready to accept the rolling stock. 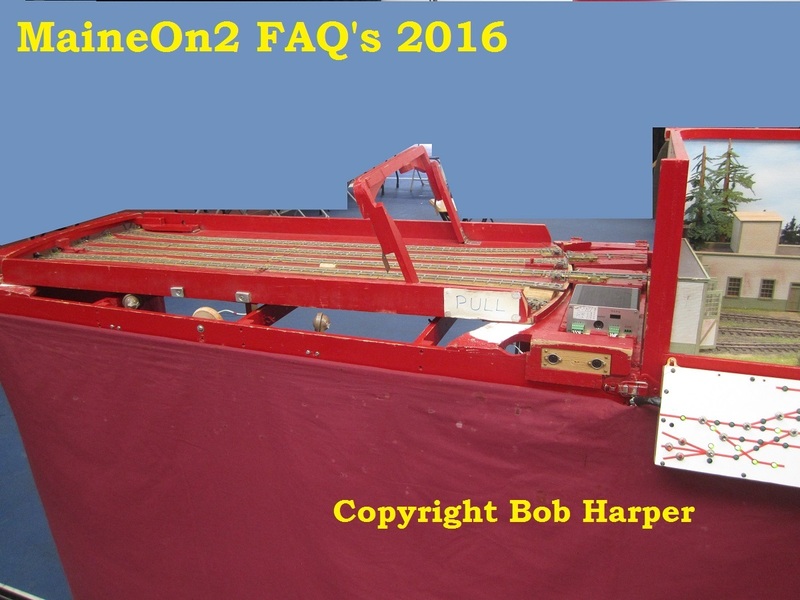 The red end stops are always kept down at the outer end of the table, and at both ends when it is being rotated. 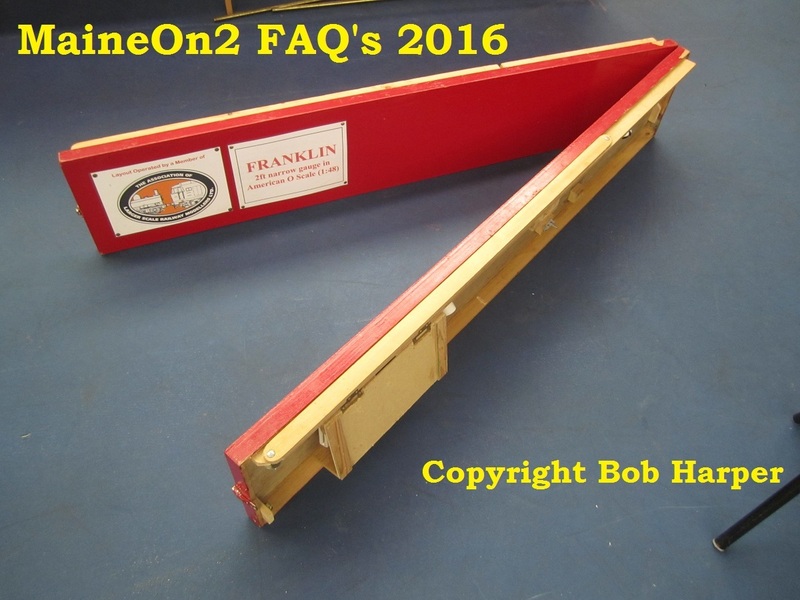 Footnote 1: Bob and the Franklin module crossed the pond to attend the National Narrow Gauge Convention 2016 in Augusta, Maine in September 2016. Click here for more details of the Convention. 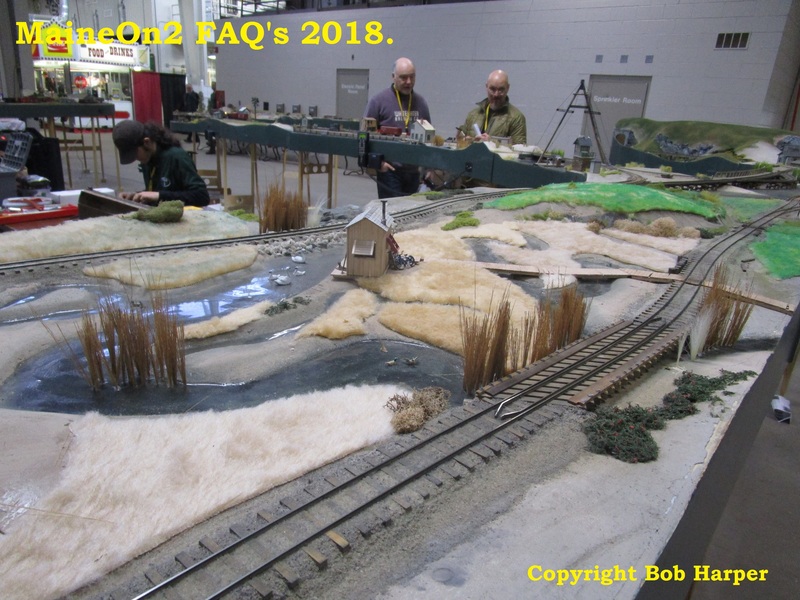 Footnote 2: The Slim Gauge Circle is an informal group of around 200 UK (plus some overseas) based modelers interested in North American narrow gauge railroads. The Circle was founded 30 years ago to provide an alternative meeting place where the emphasis was on modeling, exchange of ideas, meeting old and making new friends plus some trading. Members’ interests include Colorado, Maine, logging and mining in all scales. The Circle holds “get togethers” twice a year at Hillmorton, near Rugby, in May and November. Click here for more details about the Slim Gauge Circle. 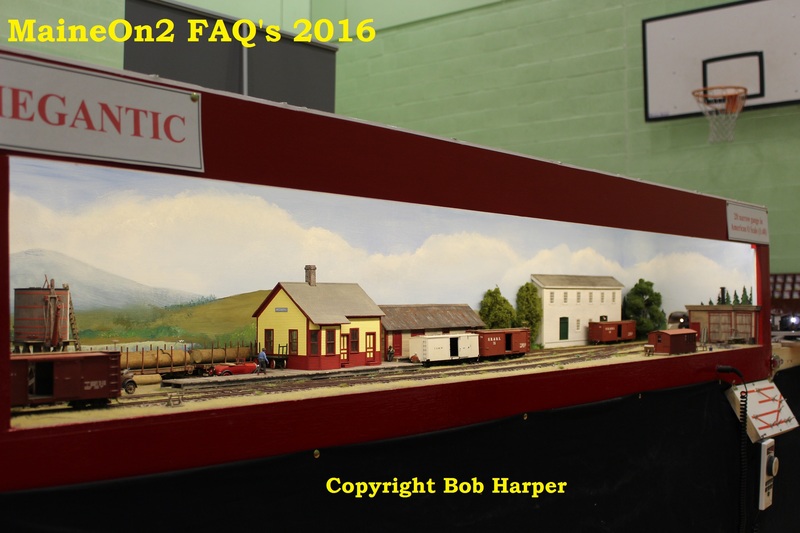 Footnote 3 (update 31-12-2016): In October 2016, Franklin was awarded the David Lloyd Trophy for the “Best Layout in Show” by popular vote at the Expo Narrow Gauge Show held at Swanley, Kent. 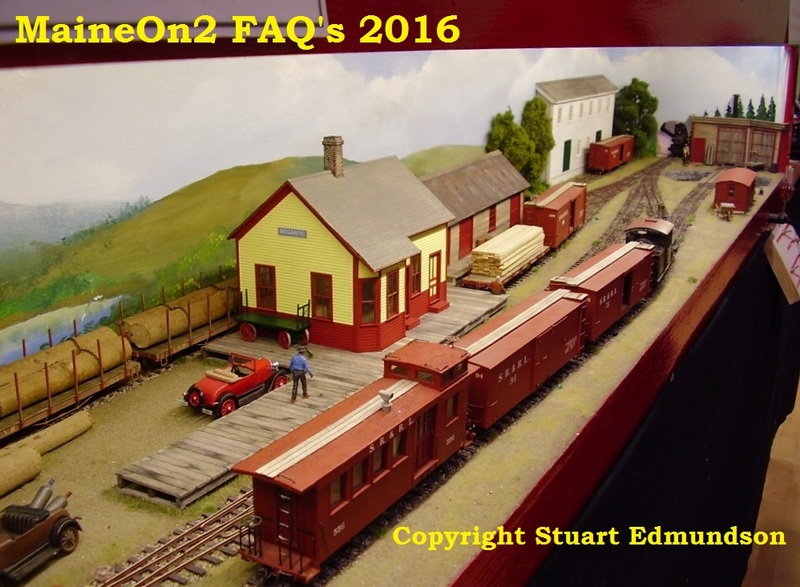 This is the biggest show in the UK devoted to small scale Narrow Gauge Railway Modeling. Click here for more details about the David Lloyd Trophy and here for more details about the Expo Narrow Gauge Show. 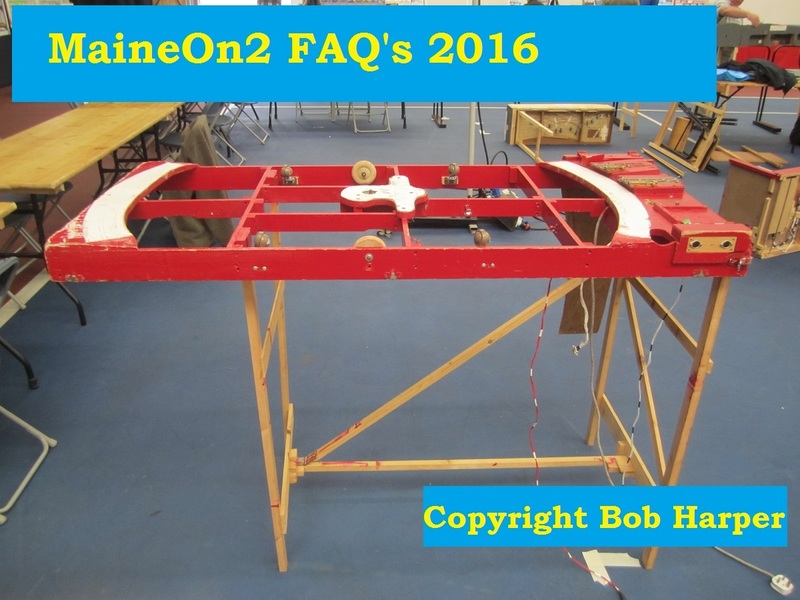 Over the last few years Bob Harper, who hails from Manchester in England, has been doing a great job showing and publicising real Maine On2 on the UK Exhibition circuit with his “Franklin” module. 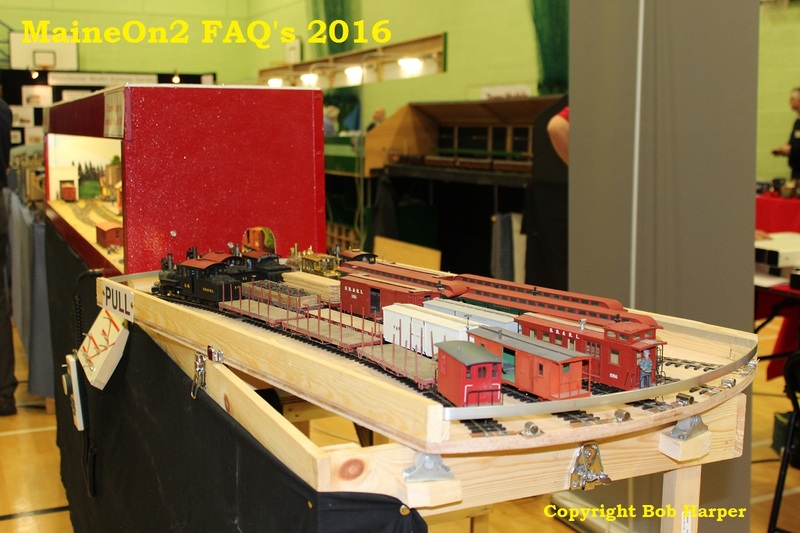 Pictured above is Bob’s new module “Megantic” at its first public outing at the ALSRM (Association of Larger Scale Railway Modellers) North 2016 Show at Wythenshawe yesterday (14th February 2016). The modules are parts of his On3/On2 layout located in the basement of his home which have been designed to be removable for exhibition purposes. Bob has a very relaxed style of operating at UK Exhibitions, and so the controls are placed at the front to enable Bob to chat easily with the audience. 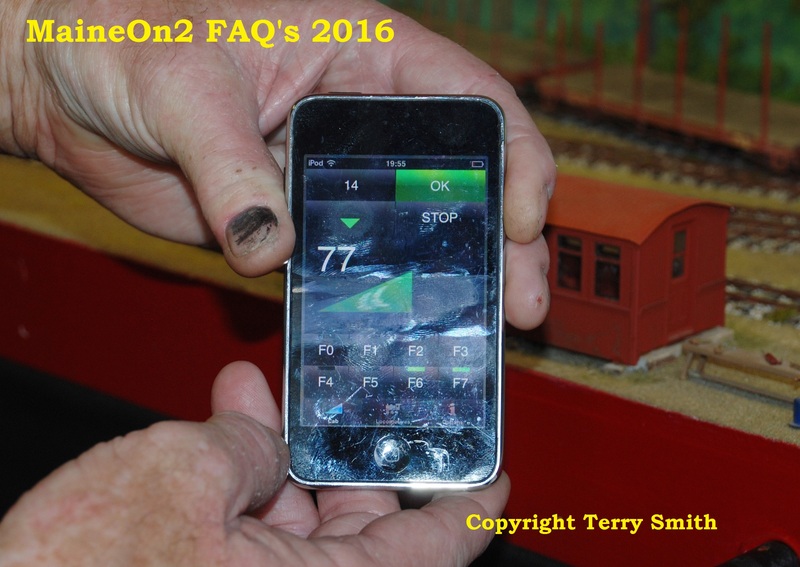 It is not unknown for him to hand the controller to a member of the audience to allow them to run the trains. Note that all the pictures in this post are shown reduced. By clicking on the pictures the larger versions are shown, use your browser back arrow to return to this page. 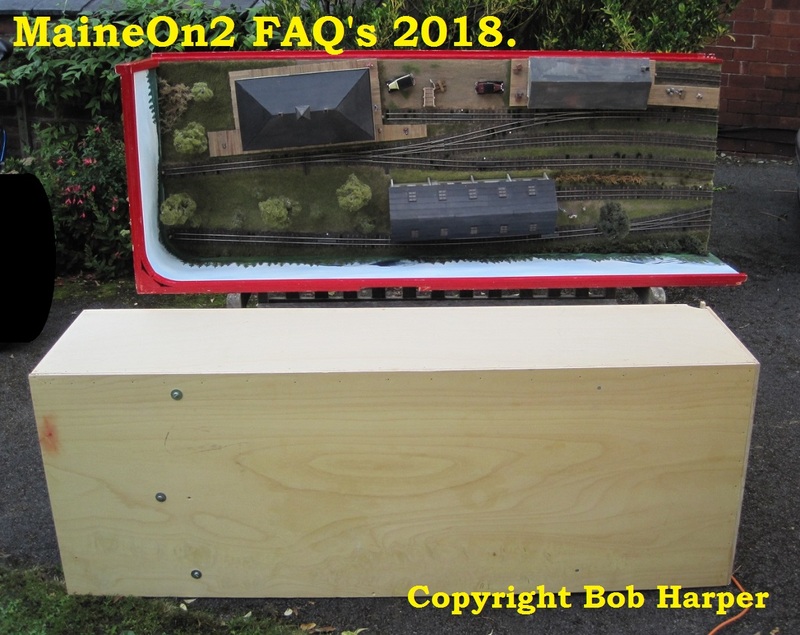 Bob’s modules are parts of his On3/On2 home layout which are removable for exhibition purposes where they are mated with a turntable style fiddle yard section to hold trains “off scene”. 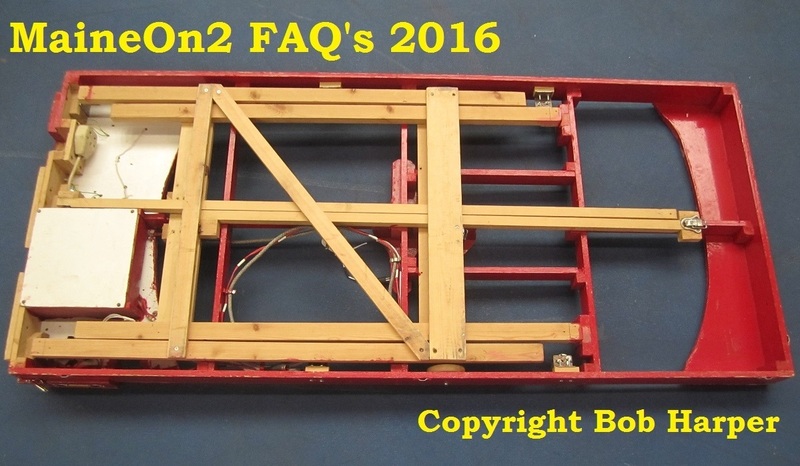 This type of layout is very popular on the UK Exhibition circuit. Bob’s open style makes it easy for the viewers to look over the stock held in reserve, rather than making them strain over view blocks. The editors made a deliberate decision to publish these pictures at full frame to allow our viewers to see the backgrounds – which are typical of many UK shows. 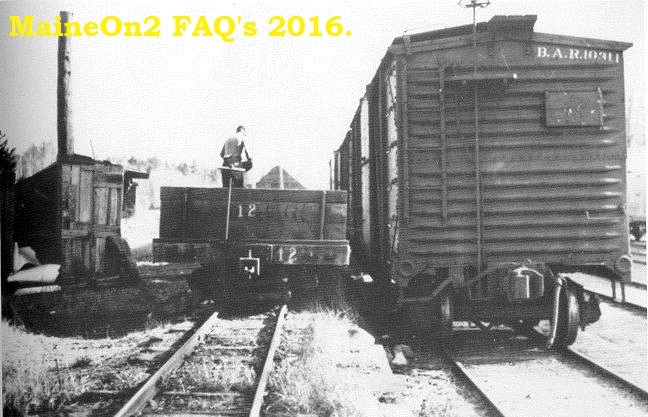 The section hut comes from the SR&RL at Kingfield. 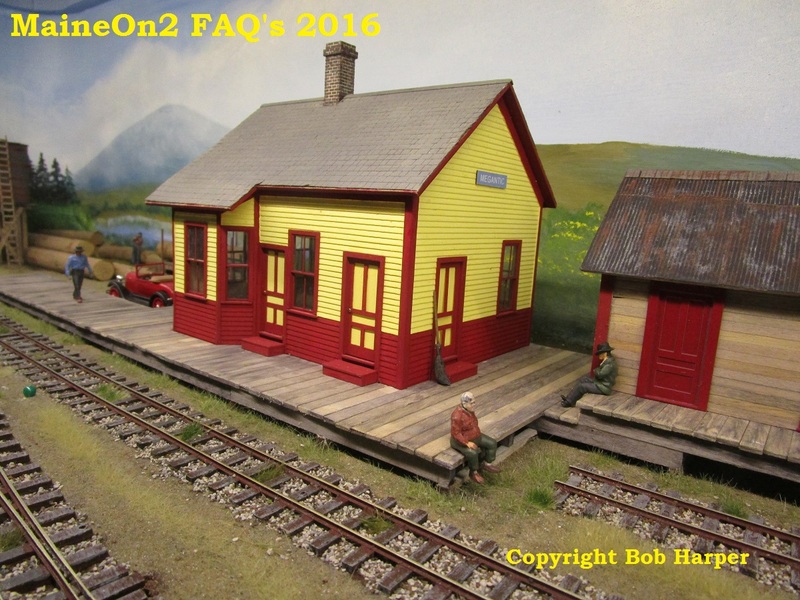 The station was built from a Mount Blue Models kit of Bigelow Depot. This structure was scratch-built and represents a prototype industry believed to be a chair factory. 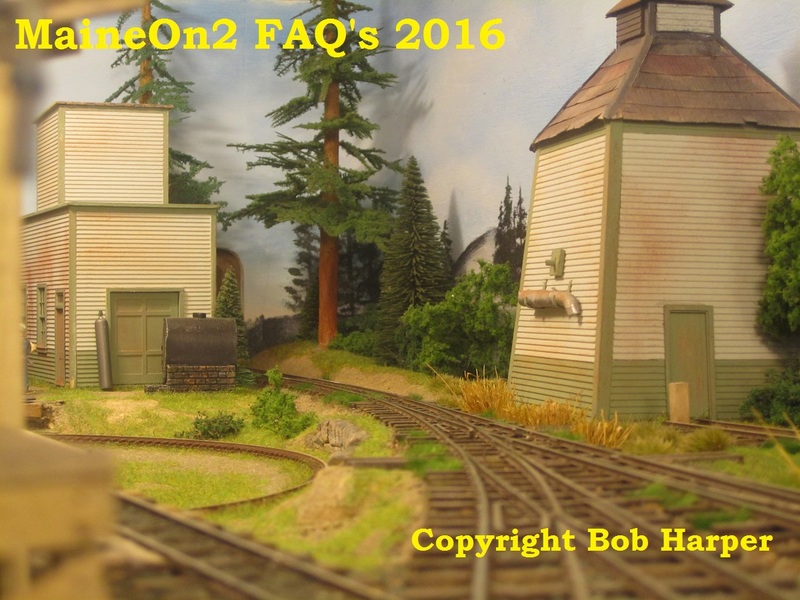 The design was based on the Mount Blue Models kit “Backdrop Industry #2”. 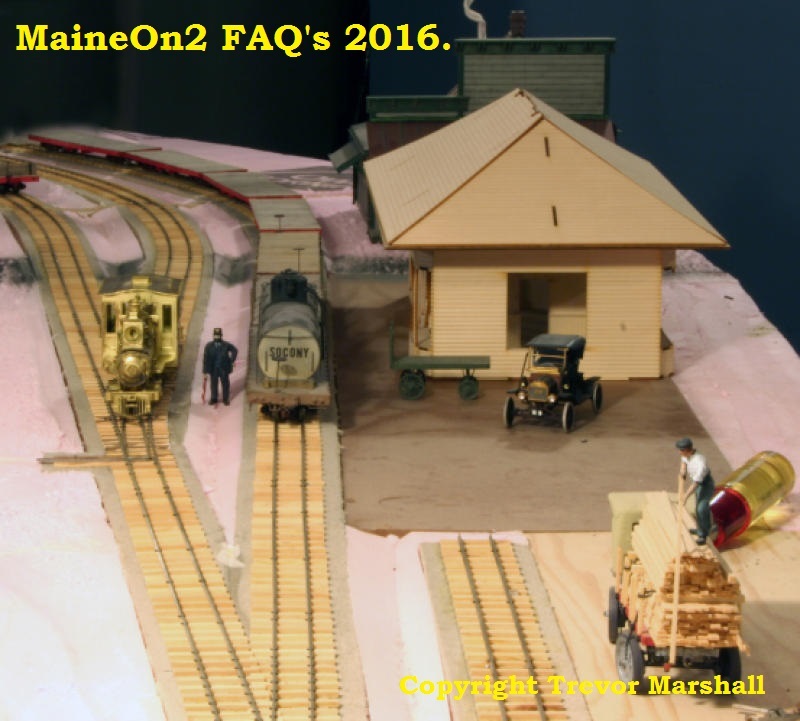 The loco shed is based on the Kennebec Central shed at Randoph (reversed) and the turntable is based on the B&SR’s at Bridgton. 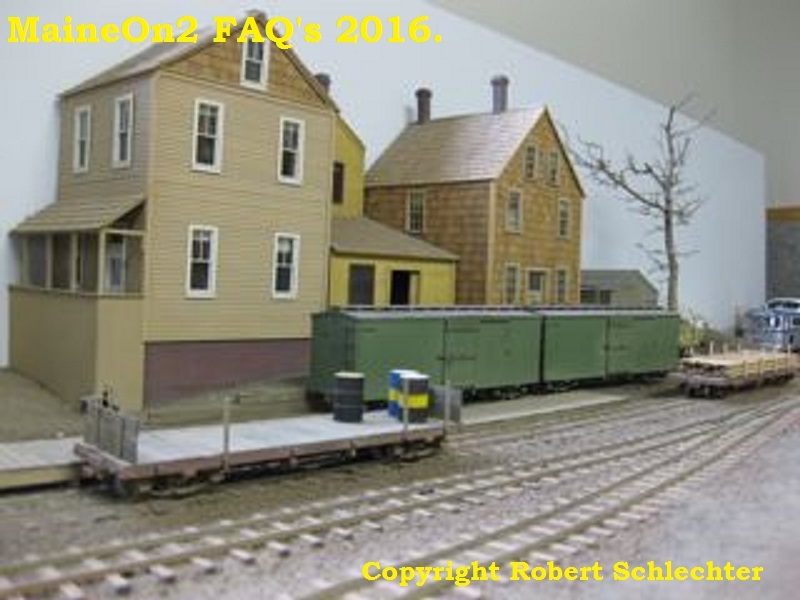 The freight house is based on the SR&RL prototype at Bigelow but is much reduced to fit the available space. 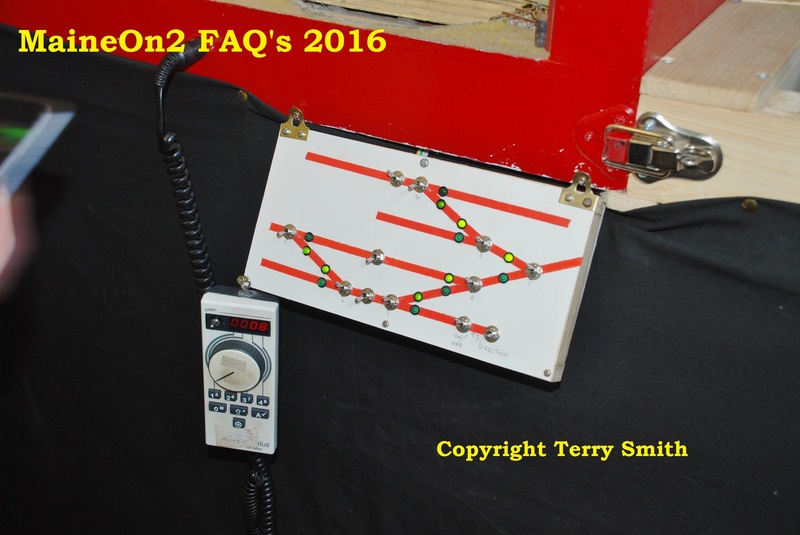 Stuart Edmundson was at the show sent in the following pictures showing trains on the module. 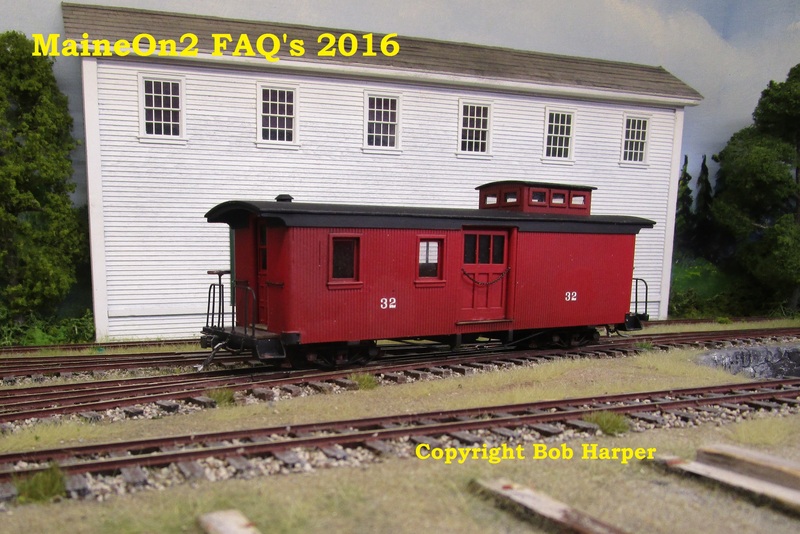 Bob’s latest addition to his fleet of scratch built rolling stock is this caboose based on the early version of the Bridgton lines prototype. 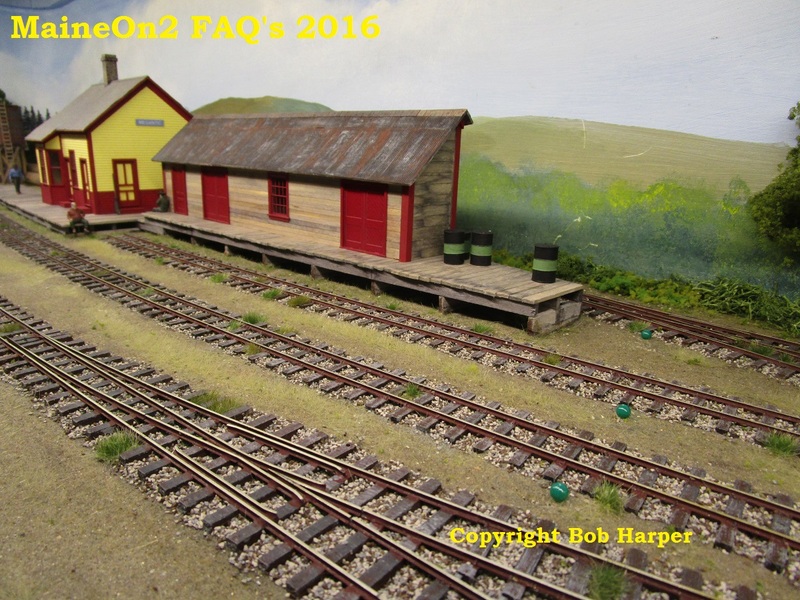 This get together was organised by the UK Borders Model Railway Club for the Gauge O Guild at Llandrinio village hall. Llandrinio is just four miles up the road from Welshpool, which may be familiar to Two Foot Fans. Bob Harpers’ introduction for the Megantic module. The Megantic module plus turntable fiddle yard plus operator and spare seat set up in the corner of the main hall. John Pearson concentrating on driving a train through the end board into the fiddle yard section. Now you can see why John was concentrating! A tight squeeze through the endboard! 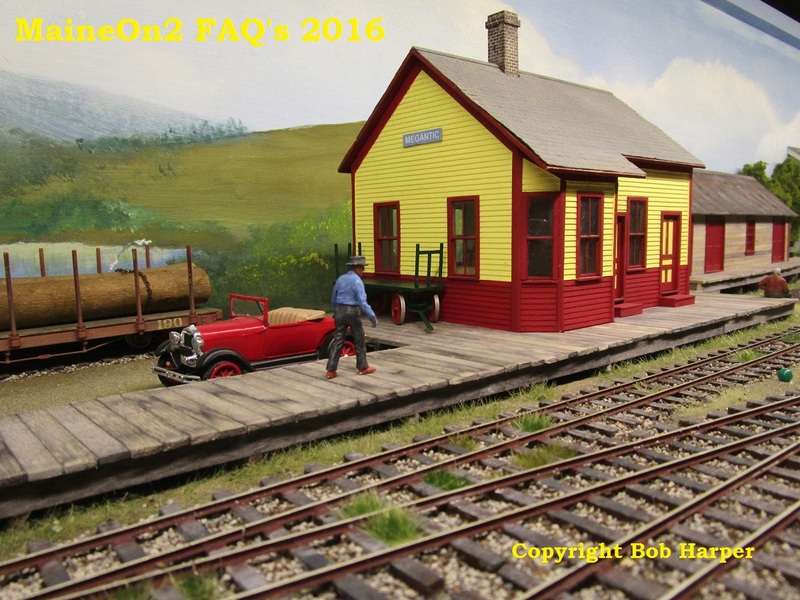 Bob Harper adjusting the track between the scenic module and the turntable fiddle yard. Also shows the rolling stock. Note that Bob uses acrylic based paints from “rattle cans” to paint his stock. For the passenger stock he uses Humbrol Brunswick Green, and Halfords Red primer or Red Plastic Primer for freight cars. The 2 reds are slightly different, so give a bit of variety. Close up of the front mounted point control board and a tethered throttle . The Megantic module uses servos as point motors. The mobile phone used as a throttle. The speed CV is correctly shown as 77, inadvertently set by the handling of the phone for this picture. It was very rapidly reset to slow the train down immediately afterwards. Bob’s ipod railway controllers use an APP called Touchcab and communicate with the Lenz DCC system via WIFI / radio waves. This low angle shot catches the nicely done clouds on the backdrop. The host club has now posted a report of the day. Click here to view on another page. 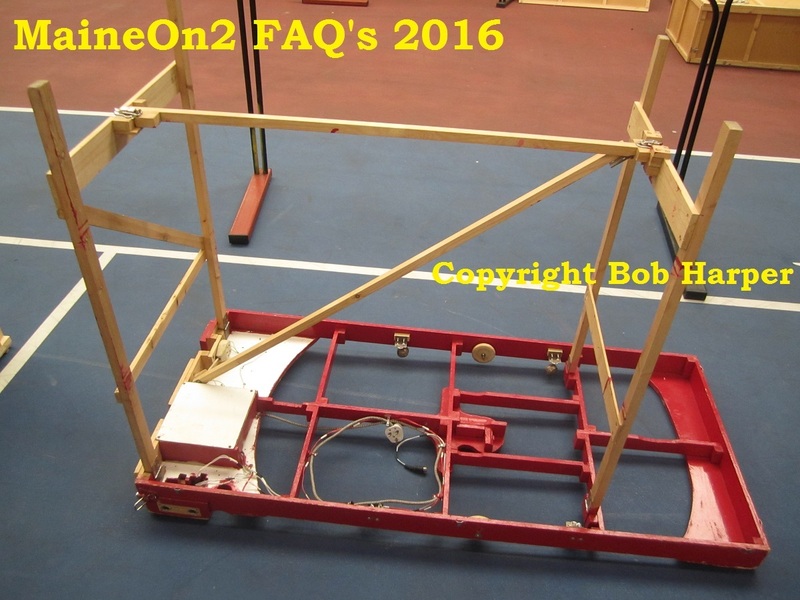 Some notes from Bob Harper on point tie-bars and reliability. 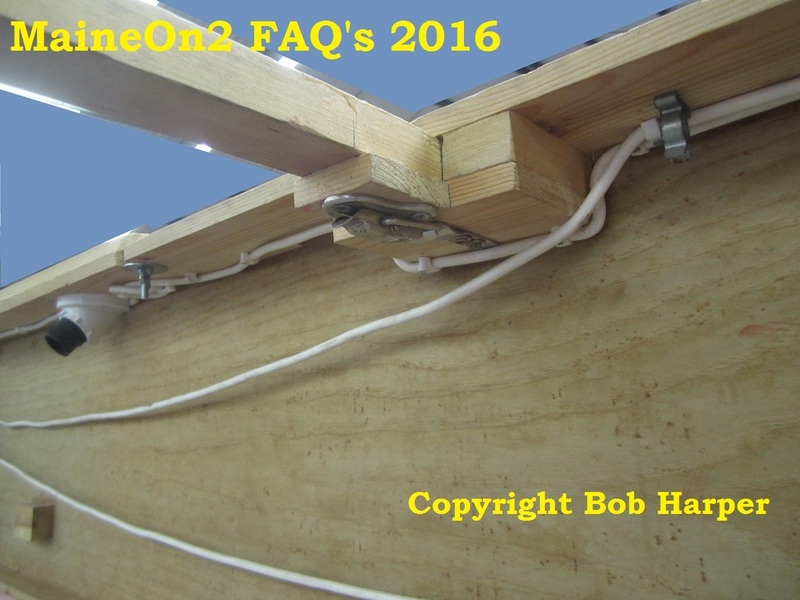 This photo shows part of my On2 yard, where I use hand-throws, which also throw a microswitch, hidden under the scenery, to change the polarity of the live frog. Most of the points on my Franklin and Megantic modules are actuated by Tortoise switch motors. The slow movement is only part of the reliable operation that I seek to achieve. 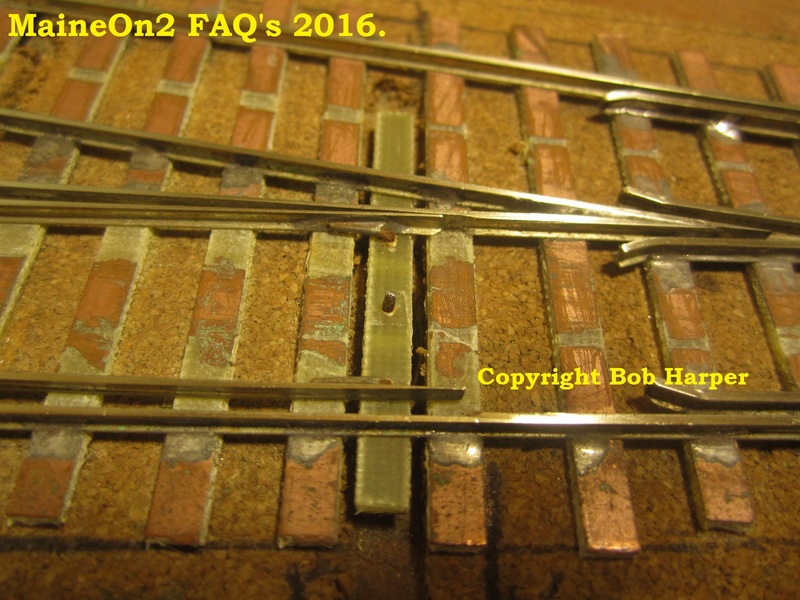 Ever since I started building my own track 40 years ago, I have completely avoided soldering the point blades to the copper-clad tie-bars. The endless flexing of the soldered joint will inevitably lead to the joint snapping eventually, (and sooner rather than later if you use solenoid type point motors), and the most used (and hence most important) points will go first – usually at about lunchtime on the Saturday of a 2 day exhibition. I’m sure you can remember seeing a large exhibition layout at a halt as somebody tries to solder the crucial points up again. My tie-bars are still copper-clad for strength, but upside down, with a 0.8mm hole drilled through at the position of each rail. A short length of brass wire in the shape of a Z is pushed through each hole and soldered to the side of the point-blades but obviously not soldered underneath to the copper surface. I used to use dressmakers pins pushed up from underneath and then bent over and soldered to form the pivots, but all the ones I can get now seem to be far too brittle and snap when I try and bend them. 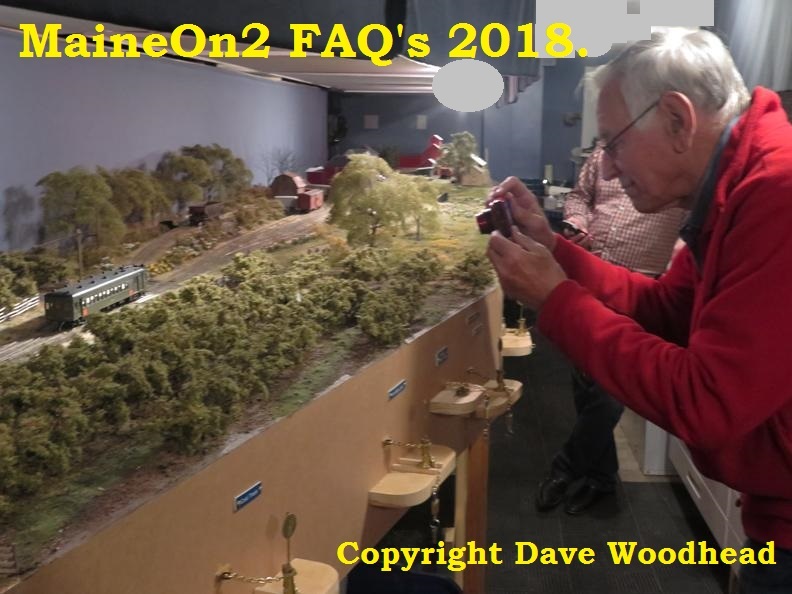 Electrically it as all very simple – what I would call “best-practice” DC – though in fact I operate the whole of my 2ft and 3ft empire, including the Franklin and Megantic modules using DCC. This means having live switched frogs, which is easily done using one of the changeover switches on the point motors or using an extra set of poles on the toggle switches that throw the point motors which is my preferred method. I have found that separate electrical feeds to every length of rail, no matter how short they may be, are essential. I do have isolating sections on the loco shed roads, and more could easily be added for a DC layout, but I use them to cut down on the noise from stabled locos that are DCC sound fitted. 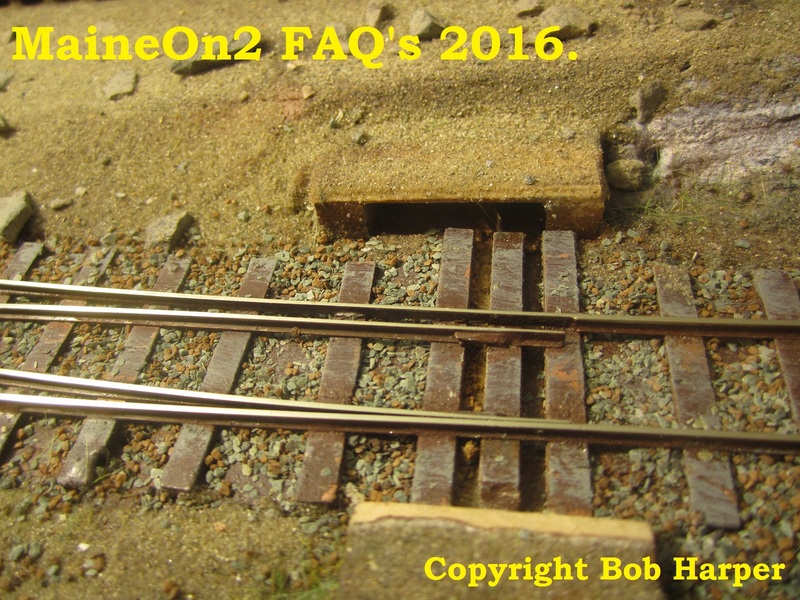 This photo shows part of my On3 yard before I painted and ballasted it, so the tie-bars can be seen better. I have used all copper-clad ties for quick, soldered, construction, but on more visible sections, I would mostly use spiked, wood ties apart from a few copper-clad ones to give strength at the switch throw and frog. The copper-clad comes in paxolin-backed (poor) and glass-fibre (good! ); looking carefully you can see the lighter green mark across parts of the tie bar – this is where I have cut insulating gaps underneath. Depending on where I can fit the Tortoise underneath dictates where the gaps go – I try to leave the area underneath where the pivot pin comes through completely isolated, just in case! 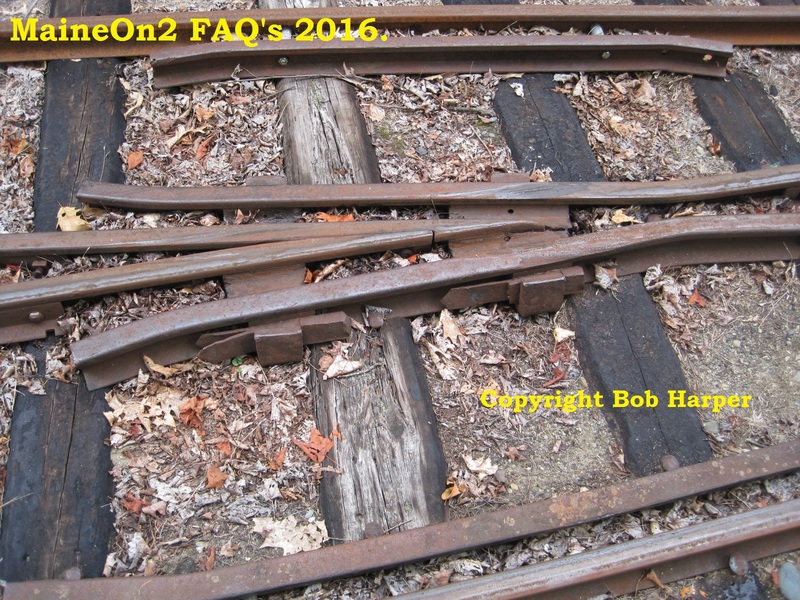 This photo shows what the copper-clad ties look like when painted and ballasted. And here’s a picture of the same area of real Maine Two Foot point taken earlier this year. 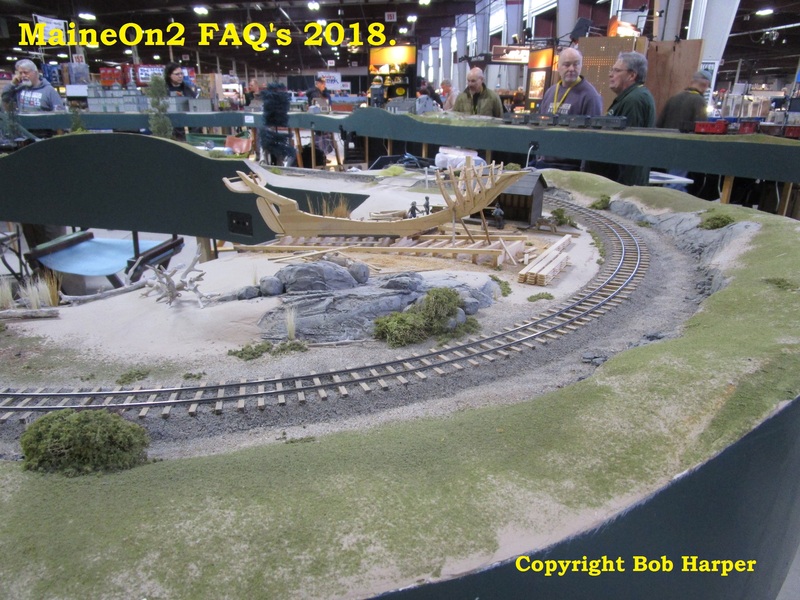 Note that Bob’s Franklin module has featured in a number of publications such as the UK 7mm Association newsletters and the Narrow Gauge & Shortline Gazette, September/October 2014 edition, and attended the NNGC in Augusta, Maine in September 2016. 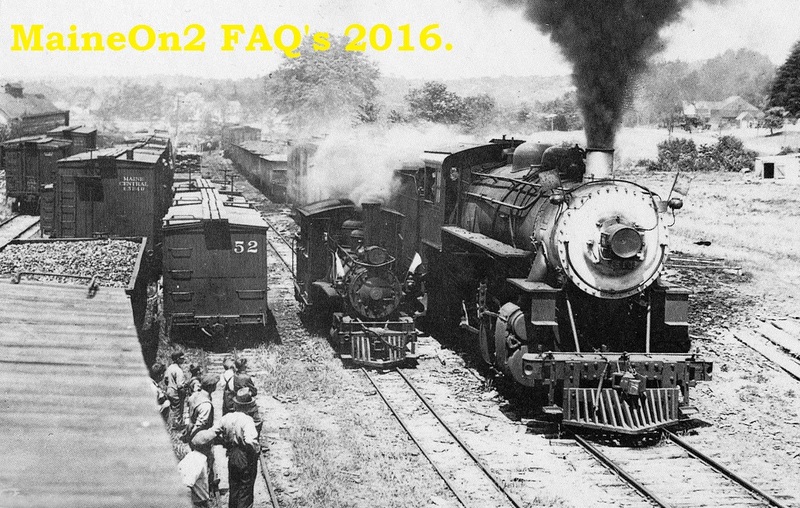 2016 National Narrow Gauge Convention. Click here to view the Convention site on another browser page.